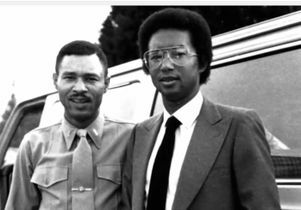 Nearly 50 years ago, Johnnie Ashe, pictured left with his brother, tennis legend and UCLA alumnus Arthur Ashe, decided to return to fight in the Vietnam War so that his brother didn't have to and could continue his record-breaking tennis career. In many ways, he rewrote what could have been a tragic alternative history. 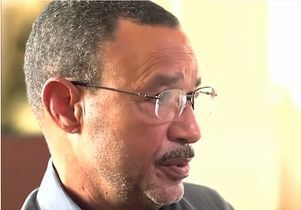 When Johnnie Ashe returned from his first tour of duty from Vietnam as a Marine in 1967, it triggered a plan in his mind that few people — not even his brother — initially knew about. 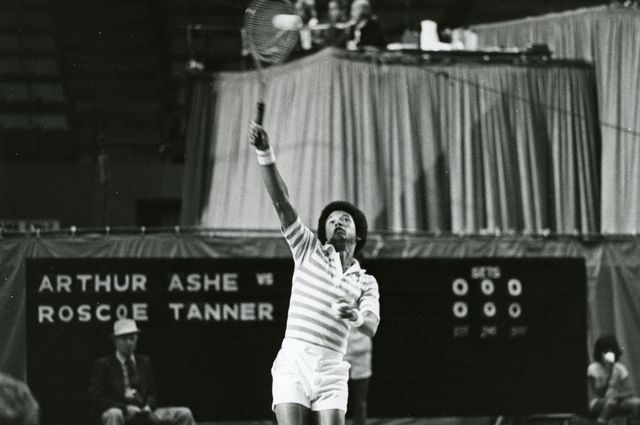 Five years younger than his brother, tennis legend and UCLA alumnus Arthur Ashe, Johnnie idolized his brother and believed that Arthur’s future would be bigger than his own. So shortly after returning from his first tour, Johnnie reversed course and returned to Vietnam. By voluntarily going back to the war zone, he ensured that Arthur would never have to go to war because of a government policy against sending brothers to war at the same time. Johnnie’s action enabled Arthur, who had graduated from UCLA and was an Army officer assigned to West Point at the time, to stay on his path, one that would lead him to win the inaugural U.S. Open in 1968 and break many athletic barriers during his Hall of Fame career. Arthur Ashe died in February 1993. Johnnie Ashe will be the keynote speaker at UCLA’s Veterans Day ceremony Thursday, Nov. 10, at 10:30 a.m. at Wilson Plaza. He will be joined by the campus community, campus ROTC units and a fellow veteran who will also speak, UCLA M.F.A. 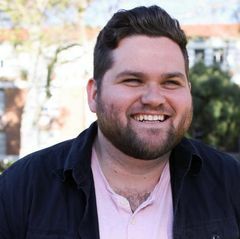 student Mitchell LaFortune. An information fair about opportunities and resources for veterans and the Warrior Games will follow the event. Johnnie recalls that their family always felt a strong bond to service. Two of his uncles were in the Marine Corps — one was among the first 20,000 ever to serve in that branch of the military. “I decided to go into the corps right out of high school, knowing that there was a possibility of going to Vietnam,” he said. 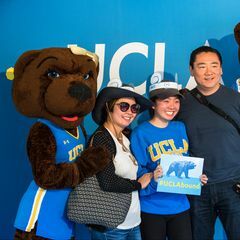 While he attended UCLA, Arthur was in the campus ROTC program. 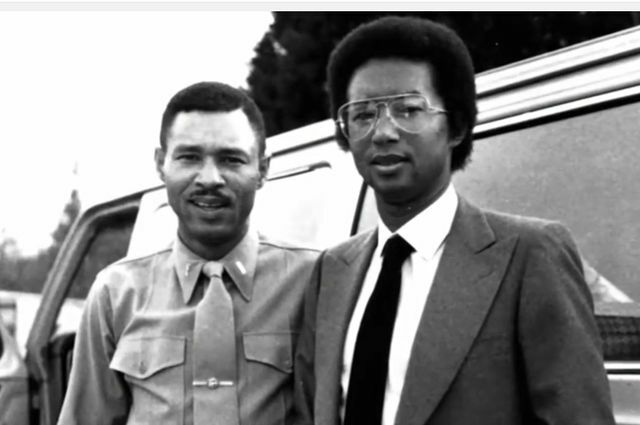 When Johnnie decided to go back to Vietnam for a second tour of duty, Arthur was a lieutenant in the Army working at West Point in data processing, while also focusing on his burgeoning tennis career. So he joined the Marines in June 1965 and deployed in August 1966 to Southeast Asia. “If I had come back when I was supposed to, Arthur would have had 14 to 15 months left on his enlistment, which was enough time for him to go to Vietnam,” Johnnie said. “This was my idea, totally my idea. I didn’t talk to anyone about it. I told them (the Marine Corps) I would do it because of the possibilities Arthur represented. “You have to realize that Arthur represented a whole lot of firsts in tennis. He was the first African-American male to play in the nationals … the first African-American to play at Wimbledon. And the sport was actually busting wide open at that time. So Johnnie looked at what he could do to help and made his decision to return to the war. The only person Johnnie told about his real motives to return to Vietnam was his father. He said he thinks that later on his father must have told Arthur, but the two siblings didn’t discuss Johnnie’s sacrifice until 18 years later in 1985. After the war, Johnnie continued his Marine Corps career and became a company commander in the 1980s. The rights he fought for are very important to his belief in service, he emphasized. “If people could walk the streets, protest and die for my right to vote, then I was man enough to be one of those who would ensure that every man had a right to vote,” he said, before calling to mind something Martin Luther King Jr. said. “No men are free until all men are free. There was absolutely no way that Dr. Martin Luther King Jr. and those who followed him could have done what they did if young African-Americans had refused to go into the military,” he added. It’s these virtues that have carried him forward. A screening of “Arthur and Johnnie,” the short, Emmy-nominated documentary about Johnnie's decision made for the ESPN series, "30 for 30," will be held at to the Calfornia NanoSystems Institute auditorium Wednesday, Nov. 9, at 5 p.m. along with a panel discussion and reception. To attend, RSVP for the event. A special Fiat Lux seminar, “Arthur Ashe and the Second Half of the 20th Century,” is currently being taught at UCLA by Dean and Vice Provost of Undergraduate Education Patricia Turner, a scholar in African-American history. Join Chancellor Gene Block and other members of the UCLA community at 10:30 a.m. Thursday, Nov. 10, in Wilson Plaza to celebrate Veterans Day and honor the many Bruins who have served or are training to serve in the United States Armed Forces. Screen shot of Johnnie Ashe from the ESPN Film documentary, "Arthur and Johnnie." 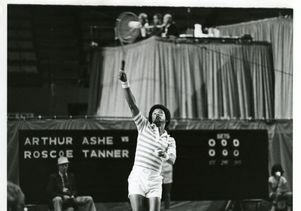 Tennis great Arthur Ashe was a UCLA alumnus.